Missing on Duty. Rear Admiral Robert Henry English, 55, commander of the Pacific Fleet's submarine force; somewhere near the west coast. A plane carrying him from Pearl Harbor circled near San Francisco, disappeared in the fog, four days later had not yet been heard from. He commanded the submarine 0-4 in War I, won the Navy Cross for patrol duty, was made commander of the Pacific submarines in 1941. 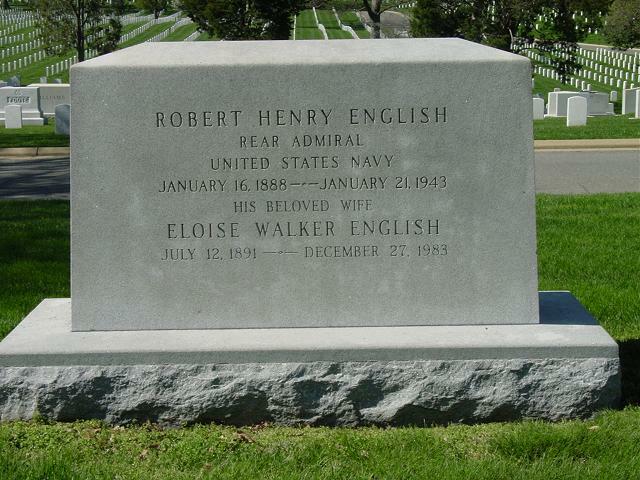 Robert Henry English (16 January 1888 - 21 January 1943), born in Warrenton, Georgia, he was a member of the United States Naval Academy class of 1911, and early in his naval career became a submariner. In 1917, while commanding O-4 (SS-65), he won the Navy Cross for his great heroism in rescuing an officer trapped in O-5 (SS-66) after an explosion. After a series of important assignments, he became commanding officer of Helena (CL-50), and during the Japanese attack on Pearl Harbor 7 December 1941 was one of the first to bring his ship into action. On 14 May 1942, he became Commander, Submarines, U.S. Pacific Fleet, and was so serving when killed in an airplane accident in California 21 January 1943. For his exceptionally meritorious service in his last assignment, Rear Admiral English was posthumously awarded the Distinguished Service Medal. The USS English (DD-696), an Allen M. Sumner-class destroyer, was named in his honor. The Navy Cross is awarded to Lieutenant Commander Robert Henry English, U.S. Navy, for distinguished service as commanding officer of the U.S.S. 0-4, engaged in the important, exacting and hazardous duty of patrolling the waters infested by enemy submarines, destroyers and mines, protecting vitally important convoys of troops and supplies and in offensive and defensive action, vigorously and unremittingly prosecuted against all forms of enemy naval activity. Other Award: Navy Cross with Gold Star (WWI). The Navy Cross is awarded to Lieutenant Commander Robert Henry English, U.S. Navy, for his heroic conduct upon the occasion of the explosion on the U.S.S. 0-5. At the risk of his own life he entered the after battery compartment, which was filled with smoke and debris from the exploding batteries, and rescued Lieutenant Commander G. A. Trever, U.S.N., from being burned to death. Other Award: Navy Cross (WWI). Posted: 9 December 2006 Updated: 23 October 2009 .